I apologise if posting other forums is against the rules. My intention is not to pull traffic away from this site, as the forum I'm mentioning isn't FZ07-specific, but is region specific. It's a long shot, but is anyone here a member? It seems to have once been a popular site, but now it's full of "Is this forum dying?" posts, and I found out why. 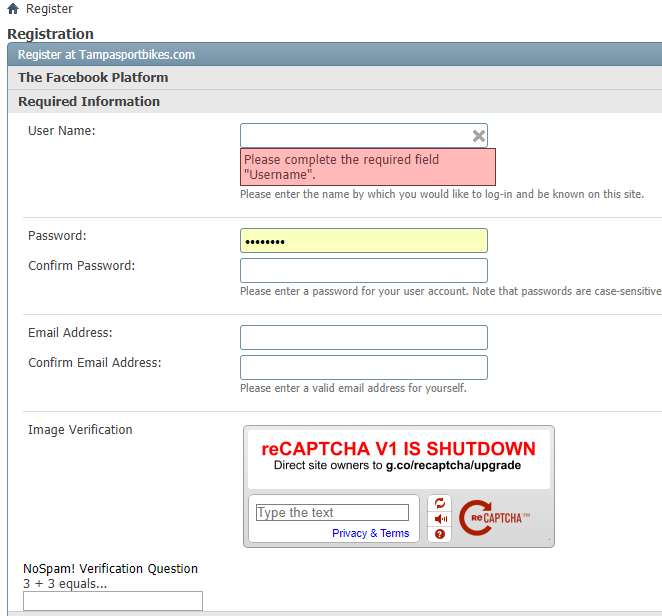 Their registration page uses a discontinued captcha, which makes it impossible to register, and there's no contact information to let anyone know that this is the case. I tried emailing admin@tampasportbikes.com, and the email address in their "support this website" thread, which is tampasportbi@tampasportbikes.com. No reply from admin, and the second one got kicked back. If anyone is a member, can you reach out to the mods to let them know that people can't register? There are 100+ guests on at any given time, and I imagine people are wanting to register and be part of the community but can't.